"WHAT a great day this can be in history!" The speaker was President Truman. The date: 26 June 1945. Men and women of 50 nations* had just signed the agreement which it was hoped would give the world a new start on the way to lasting peace - the Charter of the United Nations. Nine weeks of conference and debate and discussion had gone into it at San Francisco. But actually the work went back long before that - to Yalta and the "Big 3," to Dumbarton Oaks, back even to the first World War and the League of Nations that followed it. The League hadn't stopped war. Would the United Nations? Servicemen who had fought this war, and whose children might have to fight the next one, had a big stake in the answer. The need for some solution was obvious. Even as the San Francisco Conference met, in April, the war in Europe had lasted for more than five years; the war in the Pacific for more than three; the war in China for almost eight. Casualties of more than a million men-dead, wounded, captured and missing-had been suffered by the United States alone. The total military casualties of the nations which had fought the European war were estimated at some 14 millions dead, 45 millions wounded or captured. Civilian dead and maimed and missing reached additional millions. To "get rid of this senseless business of war once and for all," said former Secretary of State Stettinius, nations had to unite. "Bitter experience has shown that a breach of the peace anywhere in the world may sooner or later threaten the security of all nations." The name for the international organization to put an end to this was suggested by the late President Roosevelt - The United Nations. to settle international disputes by peaceful and just means. to promote world-wide progress and better standards of living. to promote human rights and fundamental freedoms for all men and women, regardless of race, language or religion. to remove the economic and social causes of war. Its members are pledged to settle their disputes peacefully, to back up the organization in any action it takes under the Charter, and to refrain from aiding any state against which the United Nations are taking preventive or enforcement action. To carry out these aims, the United Nations set up an international organization which, on a world-wide scale, had certain features familiar to any American small town : a policeman, a town meeting, a social worker and a judge. POLICEMAN of the organization is the Security Council, which has the main responsibility for keeping the peace. It is both an enforcement agency and an agency to help nations settle their disputes peacefully. If peaceful methods fail, the Council may invoke diplomatic and economic sanctions, and the use of force, by land, sea and air. The Council is made up of five permanent members-the U. S., Great Britain, the Soviet Union, China and France-plus six other members elected by the General Assembly. A majority of the Council (seven members, including all the Big 5), is sufficient to take action. Any one of the Big 5 can veto the use of force. TOWN MEETING is the General Assembly - a forum for discussion and recommendation, where every member nation, large or small, has a vote. It can discuss and make recommendations to the Security Council; call the Council's attention to matters likely to endanger the peace; recommend measures for peaceful settlement of situations likely to impair the general welfare. It has been called "the town meeting of the world," and "the keeper of the world's conscience." In any case, it will be the voice of those referred to in. the opening words of the Charter: "We the peoples of the United Nations. . . ."
SOCIAL WORKER of the organization is the Economic and Social Council, based on a new approach to war-the idea that the security of the world depends largely on the security of the individuals in it. It is the Council's job to help remove the economic and social causes of war. "Unless people have a chance to live decently, you can't expect them to behave decently," said Assistant Secretary of State Archibald MacLeish. "No provisions," said Mr. Stettinius, "can make the world secure from war if men and women have no security in their homes and in their jobs." To this end, the Economic and Social Council is charged with promoting higher standards of living, full employment, economic and social progress, solutions of international economic, social and health problems, cultural and educational cooperation, and universal respect for human rights and fundamental freedoms. JUDGE of the organization is the International Court of Justice, to which may be referred any disputes which can be settled "in conformity with the principles of justice and international law." Its decisions are binding, and any member failing to comply faces "appropriate action" by the Security Council. The International Court is also to play a part in developing and strengthening international law. 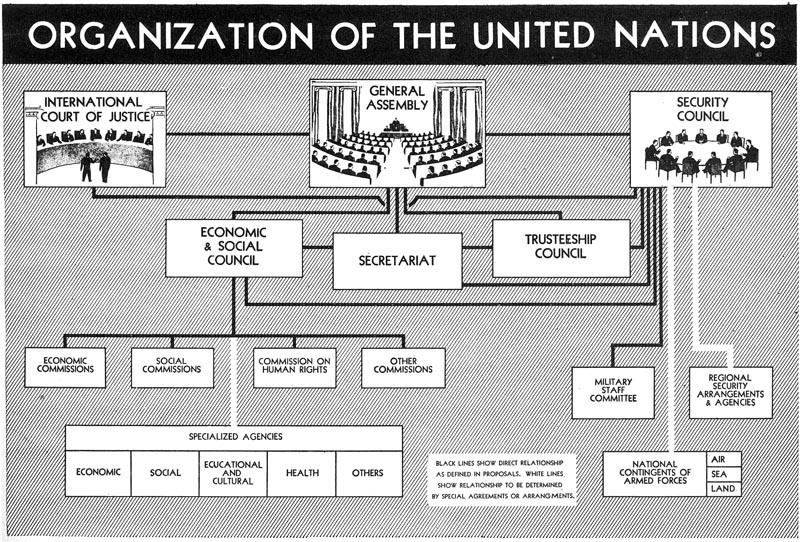 The Trusteeship Council is to promote the well-being of the inhabitants of all dependent territories over which the United Nations has responsibility - territories taken from the enemy in this war; others that were League of Nations mandates; and any others that may be put under this international trusteeship system by the nations that now administer them. The United Nations are pledged to insure the political, economic, social and educational advancement of such peoples, and to assist them in the progressive development of their free political institutions, and in developing self-government. This includes the right to independence for those peoples who aspire to it and are able to exercise its responsibilities. The Secretariat is the clerk of the organization, the general civil service of the United Nations. A permanent administrative group of international civil servants, it is responsible only to the United Nations and not to any government. * Argentina, Australia, Belgium, Bolivia, Brazil, Byelorussian Soviet Socialist Republic, Canada, Chile, China, Colombia, Costa Rica, Cuba, Czechoslovakia, Denmark, Dominican Republic, Ecuador, Egypt, El Salvador, Ethiopia, France, Greece, Guatemala, Haiti, Honduras, India, Iran, Iraq, Lebanon, Liberia, Luxembourg, Mexico, Netherlands, New Zealand Nicaragua, Norway, Panama, ParaguaA Peru, Philippine Commonwealth, Saudi Arabia, Syria, Turkey, Ukrainian Soviet Socialist Republic, Union of South Africa, Union of Soviet Socialist Republics, United Kingdom, United States of America, Uruguay, Venezuela and Yugoslavia. can be ironed out by the use of regional agencies (such as, in the Western Hemisphere, the American republics), that is done. If there is a legal basis, it can be settled by the International Court of Justice. If there is room for discussion, the parties may submit to arbitration, conciliation or mediation. If these fail, the Security Council may use diplomatic or economic sanctions, or force of arms. The Council is ready to use force quickly if needed, for it is continuously in session, is in constant touch with the Big 5's joint chiefs of staff, and can strike swiftly with air-force contingents followed by such other armed forces as may be necessary. All member nations pledge themselves to keep such armed contingents available at the call of the organization. The vote and the veto. These provisions of the Charter aroused most discussion. Why the greater power for the permanent members - the Big 5? Why let any one of them have a veto over the use of armed force - even against itself? The reasoning recognized a simple fact: these five nations - the U. S., Great Britain, the Soviet Union, China and France - possess among them most of the industrial and military resources of the world. They have to bear the primary responsibility for maintaining the peace. To the question - what if one of the Big 5 vetoes enforcement action against itself? - the answer is: if one of these nations ever embarks upon a course of aggression, a major war will result, no matter what the voting provisions are. They must work together in peace - as they have proved their ability to do in war - or no Charter can succeed, and no world organization. Agreement and disagreement. Proof that the nations could get together came at San Francisco where, despite differences, the area of agreement was always vastly wider than the area of disagreement. Attention naturally was directed to differences between the powers, because little time was needed on matters on which all were already in agreement. Between Dumbarton Oaks and San Francisco, the Big 5 had posals; others were worked out over agreed on 20 amendments to the pro - the nine weeks in San Francisco. The U. S. was never in the League. The League, while a bold and hopeful plan, was never fully used. The United Nations, all agreed, must be given a chance to work. The League lacked teeth to prevent war quickly and with overwhelming force. The United Nations has the machinery to stop an international bandit; to stop him in time; to stop him with fleets of battleships and bombers. Hunger, poverty and unemployment can lead to wars. Unlike the League, the United Nations will be concerned with getting steady jobs, decent homes, more food and a better life for more people. When all the Big 5 and a majority of the other United Nations have ratified the Charter, the new world organization will become official. In the U. S., this means ratification by the Senate. President Truman flew out to San Francisco to address the closing of the Conference, told the delegates: "You have created a great instrument for world peace. The world must now use it!" Flying back to Washington a few days later, he presented the Charter to the Senate, in a brief and simple address stated: "The choice before the Senate is now clear .... This Charter points down the only road to enduring peace. There is no other. Let us not hesitate to join hands with the peace-loving peoples of the earth and start down that road . . . . "
The Senate's Foreign Relations Committee rang up a 21-1 vote of approval, and ratification by the Senate itself was looked for at an early date this summer. From there on the road was open - and the peoples of the world, and the servicemen who fought the war, pinned their faith and their hopes on safe driving by all hands.